Managing prairie dogs seems like a never-ending battle. 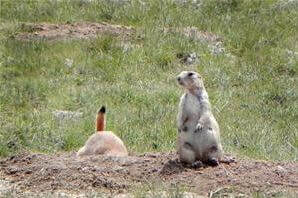 The black-tailed prairie dog is listed as a designated pest in the state of Wyoming. As part of the Special Management Program, a cost-share is available for control or prairie dogs in Goshen county. Maintaining a schedule of treatment, establishing positive neighbor relationships, and understanding prairie dog biology and behavior will increase the effectiveness of a control program. Black-tailed prairie dogs, Cynomys ludovicianus, can significantly alter the landscape. They primarily feed on grasses which are kept short to aid in visually detecting nearby predators. Burrows can be 3-14 feet deep and 10-100 feet long containing several chambers such as a listening chamber, nursery, toilet, and sleeping chamber. Average litter size is 3-4 pups which are born in April to May after a 33-38 day gestation. Black-tailed prairie dogs typically live 3-5 years in the wild, yet about half of pups which emerge from their natal burrow survive the first year of life. Each spring, year-old males are kicked out of their natal burrow and can travel up to 12 miles in search of a new town. Be prepared to execute a thorough and diligent management program in regard to prairie dogs. Despite individual litter size being relatively small, populations can double in a few years. making continuous management necessary to prevent a population from getting out of control. Once a town is dwindling in population, take measures to cover and/or fill the holes to prevent reintroduction from these roaming strays. Coordinating with neighbors on poison/bait type will allow for more consistent control as prairie dogs won't be jumping back and forth between properties at different times of the year. A basic overview of toxicants and fumigants are outlined below. Most of these products are restricted-use pesticides and require a commercial or private pesticide applicator license to purchase. GCWP offers cost-share on both materials and labor for control of prairie dogs. There are several options for poison/bait including anticoagulants (Kaput, Rozol), aluminum phosphide (Fumitoxin), and zinc phosphide (ZP Ag oats). The landowner will be responsible for covering 20% of the cost of these products. These products are all restricted-use pesticides and will require the purchaser to have a private or commercial pesticide applicator license. Cost-share on labor is on a first-come, first-serve basis and must be pre-approved before consideration of reimbursement. Contact us for more information regarding this program.